Every once in a while, you hear an album that can only be described as perfect. All components of the record—from the artwork, down to the track list—come together to create something beautiful, something bigger than all of us. That’s exactly what has happened with The Future is Medieval. Well, my version of The Future is Medieval, at least. Every other version is entry-level garbage. Kaiser Chiefs have done something very interesting. Their newest release—one that has been long awaited by this blogger—isn’t an actual record. In what can be viewed as marketing genius or pure laziness, they have left the creation of the record up to me. And you. And anyone else who wants to make their record. But mainly me. I was given twenty song options, told to pick ten of them, and organize them in the way that I saw best fit. Yeah, I guess you could do it too, but believe me, it’s a ton of work. You may as well just buy my version, as I assure you, you won’t be able to create anything better. I was also left to create the artwork for the album, which you can see above. Look at that. It’s beautiful. See, most people hardly play with the composition of the images that they are given. As a result, lots of the other covers out there look like the clip art folder on their desktop projectile vomited a meal of nostalgic children’s book illustrations. Look at my cover, though. Beautiful. I’d tell you what it symbolizes, but its numerous meanings and metaphors would melt your plebian brain. Buy my record. Okay, I’ll serious-up now, because this new concept is something that deserves at least a paragraph out of me. The fan-designed album is a very interesting idea, and I’d love to see it happen every once and a while. As long as this doesn’t become the new standard, I think this is a great idea. As I wrote earlier, it is a stroke of marketing genius. Most fans—as you can see—feel very passionately about their creations, and will share them with everyone they know—as you can see. This brings a plethora of free advertising for Kaiser Chiefs, as everyone is tweeting about the record that they personally created. I know I’ve devoted two Facebook statuses to mine already. You also get access to all kinds of posters and .gifs that you can place in your blog after you create the record, with a banner above them all reading “promote your album.” Your album. 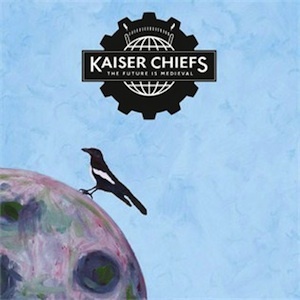 Brilliant move, Kaiser Chiefs. Just don’t do it again.